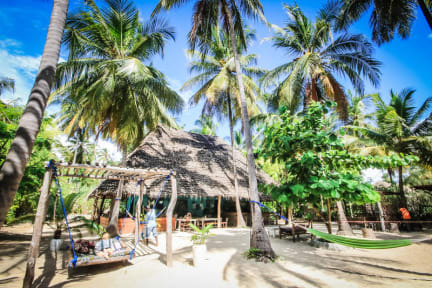 NEW Teddy's Place is situated in the south of Paje, a small peaceful village on the east coast of Zanzibar. The east coast, especially Paje, is famous for its stunning beach. The sand is as fine as flour and white as snow. You must check it out! All of our prices include a free NEW Teddys breakfast of your choice (either yummy pancakes or delicious eggs, all served with fresh fruit, fruit juice and tea/coffee). 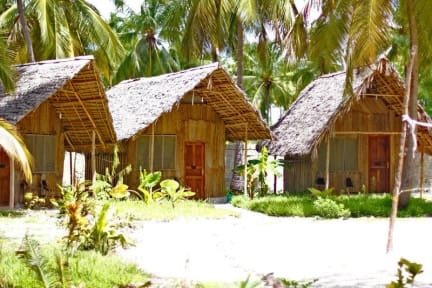 At NEW Teddys we offer you charming makuti bandas, (bungalows made of woven palm leaves). They are all equipped with mosquito nets and fans. Toilets and showers are shared. We also have superiour bungalow with their own bathroom. Beside single, double, triple bandas and quadruple we also offer single beds in a dorm bandas. Payment by cash or VISA (+5%) card or Directpay (+5%) (only for accommodation) upon departure. There is one ATM (which works sometimes) on the East Coast at the moment so we strongly recommend getting out money you need from Stonetown before you make the journey over here. We accept payment in Euros, Dollars or Tanzanian Shillings. Fue una experiencia increíble! Me encantaron las instalaciones y el Desayuno maravilloso! Just a lovely place to rest, to enjoy, to meet people, to have a beer.... The staff is amazing. They maje life easy and they are very helpfull. Also they just open a new hostel by the beach in Jiambiani. If you ever thought in Paradise....that is your place. For me they are 10!! The place is ok. The price is too expensive for the value. If you hire a taxi with them back to Stone Town or Nungwi, they don’t offer reasonable price, way tooo expensive!! Better find a driver from the beach. Falta mayor preocupacion por el cliente, en la noche mucho ruido y musica muy fuerte, no se puede dormir , dentro de los hostel que he estado es uno de los que no me han gustado y no volveria, el agua es fria y en algunos momento no sale agua, al momento de pagar la maquina no funciona.